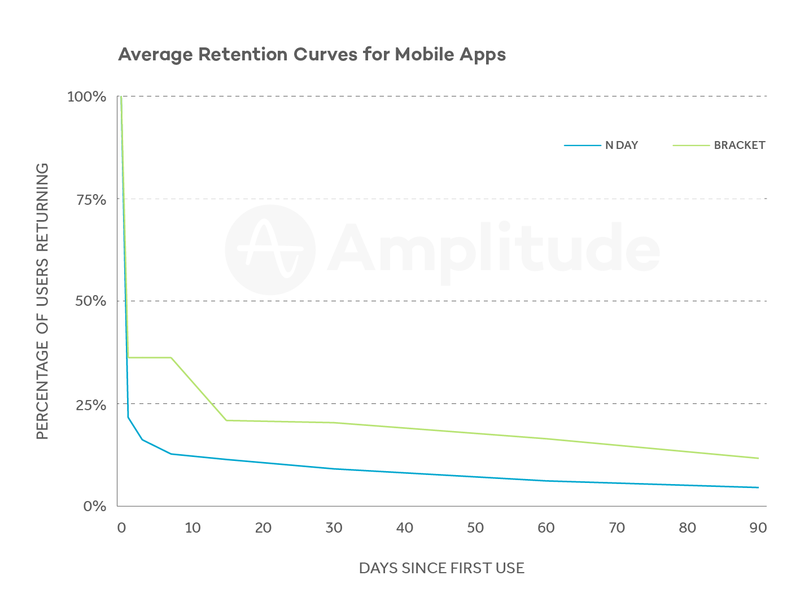 Amplitude today released findings from a study of retention data collected from its popular analytics platform and found that the most commonly used retention metric, known as ‘N Day,’ underestimates the percentage of users who return to apps over time by a factor of 3.5x. The results, which were collected from 500 million mobile devices over a four month period earlier this year, call into question the value of one of the industry’s most popular retention metrics and the importance that companies should place on it as they plan business, product and marketing strategies. The company also announced that its platform recently passed the “1 trillion user actions tracked” mark and is now processing over 100 billion user actions every month. Previously announced retention rates have painted a grim picture for mobile app companies who have been blindly led by ‘N Day’ results to believe that they’re losing nearly all of their users within 30 days. Our study found that measuring retention over periods of the user’s lifecycle, rather than on single, arbitrarily chosen days, provides a more useful measure of user retention for most apps. As detailed in the chart below, retention rates were 1.5 to 3.5X higher than industry averages reported using ‘N day’ retention. Twenty-three (23%) of mobile app users return between days 15-30 after first use and 20% returned between days 31-60. When looking at the same data set using ‘N Day’ retention, we found that only 8% of users returned on Day 30 and only about 6% on Day 60. Amplitude also announced the release of Amplitude 2.0, the next generation of their analytics platform. Amplitude 2.0 represents a significant step in the evolution of data analytics; it enables anyone at a company, regardless of analytics experience, to explore, learn and act on insights. Amplitude completely rebuilt the user experience, focusing on making charts easier to interpret, reducing the time to insight, and adding collaboration features, including a new integration with Slack that facilitates sharing and discussing insights. Users can share Charts, Dashboards and Cohorts in Slack, which automatically transform into an image preview and details about the analysis. Dozens of customers, including MINDBODY, LogMeIn, and Postmates, have been using Amplitude 2.0 during a closed beta period. Amplitude based the results of this study on retention data collected from its platform, which recently surpassed 1 trillion user actions tracked. The study looked at user activity that took place across 500 million mobile devices over a four month period between June-September of this year. The study included apps with monthly active user counts ranging from thousands to tens of millions of users and from a range of verticals like social, gaming, on-demand, e-commerce, business, and financial apps. We compared both methods using time periods commonly used by the industry; ‘N Day’ (Day 0, 1, 3, 7, 14, 30, 60, 90) and ‘Bracket’ (*Day 0, 1-7, 8-14, 15-30, 31-60, 61-90) and both iOS and Android devices were included.